This is a transcript of SYS Podcast Episode 214: Screenwriter Stephen Kogon Talks About His New Feature Film, Dance Baby Dance . Ashley: Welcome to Episode #214 of the Selling Your Screenplay Podcast. I’m Ashley Scott Meyers, screen writer and blogger of the www.sellingyourscreenplay.com. Today I’m interviewing filmmaker Stephen Kogon. He just wrote, directed and produced a film called Dance Baby Dance. Stay tuned for that interview. If you find this episode viable, please help me out by giving me a review in iTunes or leaving a comment on YouTube or retweeting the podcast on twitter or liking it on Facebook. These social media shares really do help spread word about the podcast so they’re very much appreciated. Over on iTunes I wanna thank two people who left me very nice reviews. Thank you Mike Baggett and R.D Inges. There’re certain things that I try and do with the podcast and in both of these reviews they pointed some of those things out. It’s very nice to see that people are appreciating what I’m doing. Again, thank you for those reviews guys. It’s very, very much appreciated. If you have a minute, please do go to iTunes and leave some feedback. If there’s a comment you wanna make that you don’t want to be public that’s appreciated too and you can email me at info@sellingyourscreenplay.com. I really have no way of knowing what aspects of the podcast people like and what aspects they don’t like, so all of these feedback really is appreciated and it helps me guide the show and hopefully make the show better. These iTunes reviews also really are helpful in terms of getting the podcast in front of more people inside of the iTunes system. So again, it’s appreciated if you do have a minute just go and leave me a nice review there. You can also subscribe to the podcast at iTunes and that’s just a nice convenient way to have all the episodes automatically downloaded to your device each week. Anyway, thanks again Mike Baggett and R.D Inges for leaving those reviews. Again, it is very, very much appreciated. Any websites or links that I mention in the podcast can be found on my blog in the show notes. I also publish a transcript with every episode incase you’d rather read the show or look at something later on. You can find all the podcast show notes at www.sellingyourscreenplay.com/podcast, and then just look for Episode Number #214. If you want my free guide- How to Sell a Screenplay in Five Weeks, you can pick that up by going to www.sellingyourscreenplay.com/guide. It’s completely free, you just put in your email address and I’ll send you a new lesson once per week for five weeks along with a bunch of bonus lessons. 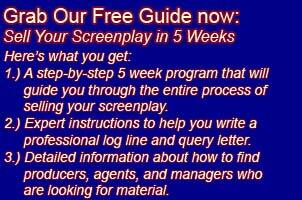 I teach the whole process of how to sell a screenplay in that guide. I’ll teach you how to write a professional log line and creative letter and how to find agents, managers and producers who are looking for material. Really it’s everything you need to know to sell your screenplay. Just go to www.sellingyourscreenplay.com/guide. A quick few words about what I’m working on, a quick update on The Pinch, the crime/thriller feature film that I wrote and directed and produced last year. I’m still kind of waiting it out with the festivals. The Pinch was selected as a finalist in the DaVinci International Film Festival. What this festival seems to do is they have a quarterly judging period, so in this case it’s February 2018. They selected nine finalists for this quarter, one of which was The Pinch. And then from those nine finalists they choose one quarterly winner and then the four quarterly winners for the whole year, they actually compete, and I think with some screenings at a festival on May which is here in Los Angeles. So I didn’t quite get into that part of the judging process but I did get at least acknowledged as a finalist. The film wasn’t really accepted into the festival, but this is a nice way for the festival to give a little extra exposure to some films that they don’t have space for. I think this is a nice thing to do for both the filmmakers and for the film festivals. You know, I’m now talking about the DaVinci International Film Festival, so I’m promoting their film festival. By acknowledging my film they get a little bit of exposure and then of course my film gets to be listed as a finalist. I can start using this in my marketing. The Pinch is now an award winning film being accepted as a finalist in the 2018 DaVinci International Film Festival. Inside the FilmFreeway interphase they have a little section where you can actually create the laurels, the little graphic that you see often on independent films. I’ll put those little laurels on the posters and stuff. So that’s nice, I’m starting to collect those. This festival is new, so it was fairly inexpensive to enter. I think I only paid $15 or $17 to enter it. That was sort of my whole goal with this festival, was just to start to hopefully get some acceptances or be able to start to collect some of those laurels and start to build up a little bit of a resume. And I did get another similar type of acceptance as a semi-finalist in the Can More Film Festival. Again, this was a new festival. This one was literally free to enter, so no real down side and it’s the same sort of thing. So it starts to get just a little bit of something that I can use in pitch letter, or I can talk about. The DaVinci International Film Festival has a nice posting on The Pinch on their February 2018 finalist page. I’ll include that link in my show notes and if you wanna learn more about that film festival you can go and check that out. I wouldn’t say these are really acceptances into festivals, but again, it’s at least a little bit of a positive sign and it’s nice that as I said, I’m able to start to collect at least a little bit of stuff that I can use in my own PR. If you remember what I talked about as my strategy for film festivals, basically they were three different types of festivals I was going to. There was a bunch of local LA festivals that I was submitting to, there were some genre festivals that seemed to specialize in low budget genre films. Those were the first third and it was LA, second there was the genre festivals and then the last third of festivals was these new festivals that were very inexpensive. And again, my whole strategy was just to hopefully get in and be able to collect some of those laurels. At least in part that is working at least a little bit, so that’s nice. On the writing front I’m continuing on with the kids TV show that I’ve been talking about for the last few months. I completed episode three last week, now I’m working on episode four. Hoping to have that one done in a few weeks, and then those four episodes, there’s definitely some re-writing. I’m kind of getting a little bit better feel of how the show is gonna work as I write these four episodes. Once I finish episode four, hopefully it will be pretty polished, but then I’ll have to go back and probably do some significant rewrites to episode one too and in probably even episode three. There’s definitely some more work to be done but that’s moving along nicely. Anyway, that’s what I’m working on. Now let’s get into the main segment. Today I’m interviewing writer, director, producer Stephen Kogon. Here is the interview. Ashley: Welcome Steven to the Selling Your Screenplay Podcast. I really appreciate you coming on the show with me today. Stephen: Thanks for having me. I appreciate it. Ashley: To start out, maybe you can tell us a little bit about your background. Where did you grow up and how did you get interested in the entertainment business? Stephen: I grew up in the State of Maryland. Before I was interested in the entertainment business I fell in love with using my own imagination. From an earlier stage, probably seven years old, I would just start writing stories. I would create [inaudible 00:07:50] in my bedroom with my toys and things like that and be up there for hours. That’s kind of where I began. I mean, I did have favorite movies, I did have favorite TV shows. My first favorite movie was probably The Wizard of Oz. Essentially I started out with falling in love with my own imagination and I knew kind of as a seven year old that this is what I wanted to do for the rest of my life…tell stories. And then I went to college in Maryland, a place called UMBC. They didn’t have a film program. I began writing my first screenplay when I was 17, I think the winter year of my freshman break. I knew then that was the most amazing experience in my life at that point. I knew without a doubt that as soon as I was done with college I was moving out to LA and trying to become a writer, become a story teller, become whatever I could become. That’s how it began. Ashley: Okay. Let’s break that down a little bit. So you’re going to college not for film. How did you even know how to write a script…that first script? Did you download some scripts from the internet? Did you have a couple of scripts, did you buy final drafts? What were some of those first steps? Stephen: This was probably a little before the internet so I didn’t have the luxury of downloading anything. I had to utilize the old fashioned library. For the kids that’s the place you go to and you check things out and there’s a lot of books there. There was a writer- J. Michael Straczynski. I don’t remember the name of the book but that was one of the first ones I checked out. I did learn about Syd Field’s book and obviously I ordered that and got that and read that cover to cover. Michael Heggs book…I don’t remember the titles unfortunately. Those were probably the three that I read earliest on and just really absorbed as much as I could from them and then mostly it was trial and error. I wasn’t very good at first. I was just loving what I was doing but I didn’t realize what I didn’t know yet until we moved out to Los Angles and got feedback and got started and then started learning. Ashley: Let’s talk about that transition. You graduate college, how did you make the move to LA? Did you know somebody in LA, did you just throw all your stuff in your car and just drive across the country? Maybe talk about that. I know there’s got to be a lot of people listening to this podcast that are contemplating the same sort of move. Maybe there’s a couple of tips or tricks you have for those folks. Stephen: Yeah, it was the last thing you said. I basically threw everything in my car, my father was nice enough to drive across the country with me because a friend of mine was supposed to go but like a week before he said, “No, I can’t do it.” So it was like, “Oh no.” My father was [inaudible 00:10:38]. The funny thing is it’s a very big move. Now that I look back it’s not that big a deal but at the time…I’d never really been anywhere in the world. This is so brand new, going somewhere I didn’t really know anyone. Maybe one person who I’d met at a workshop the year before if he still lived there. I remember the night before I’m lying in bed and I sit up and I go, “Oh my God, am I really doing this?” And I’m sweating and I’m having a mini panic attack. I’m I really getting in a car and leaving home, everything I know to go there and not come back? I panicked for a tiny bit and then I sat back and said, “You know what, the alternative is not doing it.” That was so unacceptable to me that I just said, “Fine, it’s good.” And I went back to sleep, got up in the morning, got in the car, never looked back. Ashley: Talk about those first stumbling into LA. Did you have any kind of a plan, like did you have a job lined up. Did you have some idea about how to get a job, did you have an apartment? How did you even know where in LA to go? LA is just sort of an urban sprawl for 100 miles. How did you know where in LA you wanted to end up, research? Maybe just talk a little bit about that process. Stephen: Yeah, I did look up some areas, West LA, North Hollywood, all these kinds of areas just to know some of the area. I had a mind when we moved out to pick up classifieds and things like that and just looking for apartments. I didn’t know the areas well enough. I didn’t know what was a good area, a bad area. I didn’t know what was better for artists or more convenient. So I settled in West LA. I lived in a place there for a year and that got too expensive so I moved to a cheaper place also in West LA and I stayed there for quite a bit. That was kind of how I started. I knew one person who lived in Westwood. The person who I did have the workshop with, he lived there. So it was nice to have somebody there, but he moved like within a year. He got tired of the industry and so I was back to mostly being by myself again. Ashley: Let’s talk about those first steps. You’ve got an apartment now, did you start to find a job, and how did you go about that process? Maybe just again talk about that because I know that worries people a lot, you know, how are they going to just get to LA and make ends meet while they pursue their writing career? Stephen: I made sure to have some savings saved up, so I didn’t have to worry as soon as I stepped out of the car in Los Angeles to have to look for a job. I knew I would need a little bit of time to learn the lay of the land, kind of figure things out, start sending out queries to agents and producers and all those kind of things. Obviously the most time for me things didn’t happen right away. Essentially my first job, I wanted to get on film sets I did background work…extra work. There was plus and minuses. I met some very interesting people. I got to be on set, some things like that. That was the first time I’d ever been on set and watching how things were actually done. I didn’t see a future in that. It was not something I wanted to make a living doing. So probably about six, seven months and then I did get a job working with kids after school at an after school special needs program. It wasn’t exactly full time, so it allowed me time to write in the morning and write in the night or whenever I want. Ashley: How many scripts did you have? You said when you got here you started sending out queries to agents and managers and that kind of stuff. How many scripts, so your freshman year in college you wrote your first one. How many scripts then did you have when you actually stumbled into LA? Stephen: I had two at that time. Ashley: Okay, and hat includes that first one? Ashley: Okay, and what would you say the quality of those scripts was? Were you pretty confident that they would land you an agent? Stephen: At the time I was [laughter]. Looking back you could see I had some ability. I had imagination, I had a sense of humor, I had some things…dialogue that I was doing well. I didn’t understand structure. I over wrote, I always meandered. There was nothing that was really what a screenplay should look like. It wasn’t until my third screenplay when I really started learning a lot more. I learned, took workshops, I joined things like The Script Writers Network, started meeting people, started getting feedback. All kinds of good things that helped me out and my third screenplay I finally learned the benefit of writing high concept if you wanna get people’s attention. So I wrote a high concepts family comedy script that was called Go To Your Room Dad, about a multi-million dollar orphan who adopts two parents off the street in order to get a tax break. Saying that to people I heard them laugh in the room. It’s like, ”Oh, maybe that’s kind of I’m on to something.” I was able to get my first agent with that script. Ashley: I see. I’m curious too and this is maybe taking us a step back. Did you ever contemplate trying to get your career going from Maryland, and if not, why not? Stephen: No, I never did. To me Maryland and Hollywood, it’s like Pluto and Earth. It was that far away, it’s such a different world. Back then again it wasn’t as connected as it is today with the internet where if I lived in Maryland today, grew up in Maryland today, there might be an opportunity to actually do that because you can email so easily, you can learn so easily, you can go to a website, contact them and do all those kinds of things. Back then…I mean, I’m not that old. We had cars [inaudible 00:16:14] [laughter]. But it was right at the burgeoning age of the internet and it wasn’t as established as it is now. But even saying that, I would still, if you’re serious about being in the entertainment industry, your best bet is coming to Los Angeles because that’s where all the jobs are, that’s where the people are, that’s where the networking opportunities are. So if I had the opportunity I think I would still move out here. Ashley: Yeah. Let’s talk about getting your first agent, and maybe walk through that process. How did you end up landing? Obviously you wrote this script that you felt pretty good about. But what were the logistics of actually getting that script to the agent and getting signed by that agent? Stephen: It was pretty straight forward. I just sent them the script, they called and said, “We’d like it, come on in and meet us.” I went in and met them and they signed me on the spot. It was kind of a crazy agency. The woman was a little…I don’t know the correct word for it. She was a little eccentric. Maybe that’s the best…there was live animals, live stork walking around in the office [laughter]. It was a wild kingdom in there. I was thrilled to have the experience. What the experience taught me though is that when they finally went out with the script when it didn’t get bought immediately , no one ever bought or optioned it or anything, you’re not as important anymore. Like when we first sat down and she had me come in and she wanted me to talk to the interns about how I wrote it and pitch to them about [inaudible 00:17:47] and all these kinds of things, thinking I’m doing great and then when they go out with it…She wasn’t a major cloud agency but she went out with it to some studios, production companies, those kinds of things. Like I said it didn’t get any interest and the next time around it’s like I noticed the phone calls don’t return as quickly and that kind of thing. I eventually moved on from them. Ashley: How did you get that initial read by that agency? Did it start with a cold call to them? Did it start with a creative letter or did you just send the script all in one? Was it email, was it just regular mail? Ashley: I always like to get a sense of the scope of what writers are doing. It always sounds very easy in you’re describing it, but I’m sure you were submitting to other agencies and probably not getting the same reception. Do you remember how many query letters you sent to get that one meeting and ultimately get that one agent? Stephen: Yeah. I hope I’m not giving the impression it’s easy. It’s the opposite of easy. I sent out probably hundreds…not that many, but over the years I’ve sent out a lot and [inaudible 00:19:27] response. Some read it and I probably got maybe one or two more agencies. I can’t remember on that one if they read it but yeah, it’s best to send out in volume because it’s a numbers game. You just [inaudible 00:19:44] somebody. Ashley: Okay, so let’s dig into your latest film Dance Baby Dance. Maybe to start out you can just talk about or just give us a quick pitch or log line. What’s that film all about? Stephen: It’s essentially about…it’s an underdog kind of story about a tap dancer who goes out after his dream against great odds. He used to be really, really good like in his mid-20s. He was about to achieve his dream in New York and then he had a horrible knee injury and it kind of ruined everything. But he rehabbed like crazy, he loved doing this more that anything else in the world and he was gonna keep at it. As he got another chance he injured his knee again, had to take a step back. And then what happens to a lot of us, life kind of happens. You met somebody, got into a relationship, you got a job, you got a better job, you got married and the next thing you knew, 10 years passed and he still had this dream though. He had a regular life but he didn’t wanna give up the dream just yet. And so he saw one last opportunity. This showcase coming to the town that he lived in. If he made this showcase…it was kind of like an audition in front of an audience, he’d be part of a year-long dance tour and that would be great. People would know him as a tap dancer, he would be happy, be satisfied. Afterwards he’d probably have more tap dance opportunities if he wished. So really this was his one last shot. He knew it was an uphill battle because he was now older than most dancers and still hadn’t completely recovered from the knee injuries, he was rusty and seeing some of the other tap dancers that he saw n line, how amazing they were…It was a long shot but it was his dream and he went for it. Ashley: Where did this idea come from? What was the genesis of this story? Stephen: Well, essentially I’ve always been a huge fun of underdog stories [Inaudible 00:21:37] is one of my very best. But any kind of thing with an underdog aspect because I’ve always related to that, I’ve always kind of. So I’m not majorly connected, I’m not a great sales person, I can’t walk in a room and light it up and, “Hey, hey, hey, look at me!” No, I’m not that kind of guy. So I always saw myself more of an underdog. Those kinds of stories have always appealed to me. But this kind of came out of [inaudible 00:21:57]. I would walk on the beach maybe once a week or so to clear my head and often that’s when my best ideas would come. And so one of these days I was listening to at the time a lot of old school soul like Sam & Dave and Stevie Wonder and Gladys Knight and the Pips and Jackson Five and things like that, and I just saw myself tap dancing to them even though I’ve never tap danced before in my life. It just made me really happy and as I’m smiling and listening to these and tap dancing to these in my head, that and the connection to what the underdog story, the two came together in a melting pot and that’s how the story came about. Ashley: Did you have any knowledge of tap dancing before writing this? Did you not have some friends that were into it? Was there any knowledge at all or purely it was just an idea and then you went ahead and researched it? Stephen: No knowledge whatsoever. I’d seen it obviously. I’d always been a casual fan, you know when watched Gregory Hines or Savion Glover I would always say, “My God, they’re amazing. That’s dazzling. So athletic, so impressive!” But as far as me ever taking a class, me knowing anybody, anything like that, no. I mean, it sounds insane. If I told someone at the time I’m doing this I would hope they would say that’s insane, because you don’t know how to tap dance, you don’t know anyone. I didn’t tell anyone at the time because I didn’t wanna hear them tell me I was insane. So I just went ahead and did it. Ashley: Okay, let’s talk about your writing process. How much time do you spend outlining the script and how much time do you spend actually in the final draft writing script pages? Stephen: I don’t know if I can give a designated time. It depends on which project. Some are longer, some are shorter. I always…now, I didn’t when I first started, because outlining to me is like having a road map. You kind of don’t meander when you know where you’re going. So I do outline…I’m fairly quick with the outline and I’m fairly quick with my first drafts because my belief is get it done, not get it right. So my first drafts are awful. I would never show them to anyone, you know, there’s gaps in there, I even write in parenthesis, I’m skipping the scene and coming back later if I don’t have what I want from it yet. I just wanna get through with. I look at it like a sculptor might look at a lump of clay. Once I have that first draft in front of me then I start sculpting it the way I think it needs to be I’ll go over next draft and may look at just characters, I may look at just plot, I may look at just dialogue or I may look at it all at once and just…I’ll keep doing it, keep chipping away, keep at it, keep sculpting until it’s what I think I want. Ashley: Okay: you mentioned Syd Fields is one of the books that you read. I mean, he was real big on structure. How do you approach structure in a screenplay? Stephen: I try to handle that in the outline. I have the basic kind of…I know kind of the basic three-act format and try to handle it there and then I don’t overthink that though. I’m sure a lot of writers, it helps them to get that exactly. For me I always felt it a little bit inhibiting if I overthink the structure because I kind of lose the joy of writing if I think too hard about, “Alright, am I matching, is the inciting incident happening here, is the two happening…” So I kind of…especially in my first draft like I said, I just go through them and the structure may be off, and I’ll come back and try to work on that later. But yeah, I don’t work like that. Ashley: What does your day look like when you’re writing? Do you typically write like an hour or two in the morning and then work on other stuff. Do you try and just write for like 17 hours a day for a few days or try and get that first draft done? Stephen: Did you say 17 hours a day? Ashley: You know, just basically like really just muscle through that first draft. I have friends who do, I mean…it’s everything in between, but I definitely have some friends that they just camp out for a weekend and a day or something and just pump out that first draft, but then there’s other people that just write an hour or two a day and eventually have a first draft. Stephen: Yeah, I don’t have a set way of doing it. It’s kind of like a [inaudible 00:25:59] If I’m real passionate about a script those are the ones I finish. The ones that keep me up at night. The ones that when I have to turn the light on and jot down notes or talk into a recorder and say, [inaudible 00:26:11] because I know I’m gonna finish and they go fairly quickly especially those first drafts. So it could be a few hours a day. Sometimes less, sometimes more. I mean, I lose track of time. Usually I prefer writing at night. I’m more of a night owl, so when everything’s quiet I know the world is asleep, there’s a sense I can enter this world and it’s me and the story I’m creating and I just go at it until I’m too tired to keep my eyes open and then…So I’d say it could be anything from an hour. I write pretty fast, so I don’t need usually three to four hours a day. I could get a lot done in an hour. Ashley: Okay. What does your development process look like? You mentioned these first drafts are something you wouldn’t show to anybody but once you have a second draft or third draft, I guess that’s the first question. How do you know when it’s ready to show people and what does your actual development process look like? Who do you show the script to first? Stephen: I don’t have a specific when I know, it’s more of a gut feeling. I kind of reach an “Okay, I like this now and I’m ready to give it to others.” It could be people in the industry I know, it could be friends. I think it’s best to give it to people who understand script writing and storytelling at that stage because they’ll I think give the most helpful tips if any are needed or best feedback, and I’ve always…and I learned this early on, the importance of creating an atmosphere when reaching out to people giving feedback, making them know as much as possible that I’m okay with them being as honest as possible because they won’t be helping me at all if worried about hurting my feelings. I try to create that atmosphere as much as possible, so they’re free to say whatever is on their mind. It doesn’t mean I have to agree with it, what I try is couple together if people are saying the same things, then it’s kind of like, “Okay, that’s starting to…more than one person’s said that. But again, I still often go by guts. Sometimes I’ll still do it the way I wanna do it and other times I’ll be like, “Yeah that makes a lot of sense.” It depends on what the feedback is. Ashley: Okay, so now you’re kind of done with this script for Dance Baby Dance. What was your next steps? You got a script that you like, maybe you’ve sent it out, you’ve gotten some feedback, you’ve reworked it, now you’ve made a decision I’m gonna try and produce it, or maybe even take a step back from that. Was this always the intent to write, direct and produce this yourself or did you try and send it out to some producers or agents before that? Stephen: Yeah, this one I wanted to do on my own. I reached a point where I was a little frustrated with the sending out process. I kind of believe that this is a town run by marketers and you have to be really good at marketing, really good at salesmanship and it’s my own fault that I’m not good at those. I would recommend to anyone starting out, get as good at those as you can. I never bothered to get as good at those as I should. I was always a little stubborn, I preferred to work on my own craft instead of going out networking and pitching and doing things like that. So I reached a point where I said, “You know, the technology now is cheap enough where I can actually go out and make my own movie. I don’t have to try to give it to somebody. I’ve also experienced things where I’ve had projects almost become movies. We’ve come like inches close where as the writer I was kind of stunted aside. It’s like, “We’re gonna rewrite this, we don’t care what your opinion is, we’re gonna rewrite every single word if we want to. That just wasn’t okay with me. That feeling…my stories mean something to me. I believe in them. I want them kind of the way I envisioned them. And so I said this story means enough to me, I’m going to try to tackle it all on my own. I’m gonna do everything. I’ll produce, direct, act, dance, everything that is under the sun. I ended up being the music supervisor. Everything that had to be done I was going to do. Ashley: Did you have some experience directing and producing before this? Stephen: Not really. I mean, I’ve directed little shots and little webisodes, things like that. But no, this was a huge, huge jump in experience for me. I did it because I felt I knew the script so well, the story so well that I didn’t feel anyone would do it as well as I could from my point of view. Ashley: Okay, so then what are those first steps to raising the money? Did you take it out to friends or how did you go about trying to actually get the money to shoot this? Stephen: The first step was writing a business plan and then after the business plan, doing a crowd funding. At the crowd funding we raised $30,000. Everyone who was in the independent world game who’s trying to make their own films would say, first money in is so important. That’s when other investors will start to take you seriously if at all. If you come at them with zero dollars they’re like…you know, you prove to me that other people think that this is worthwhile before coming to me. After the crowd funding, that’s when I went out to the rest of the world. But I wanna back track a tiny bit and that…because no, I don’t wanna give the impression that I’m good at this in any way. I consider myself an awful fundraiser, an awful salesperson and I still accomplished it. The only reason I think I accomplished it is because I was so passionate about the project. It made me fight through my discomfort zone of asking people for money, which I can’t stand to do. It’s very uncomfortable, but I was so passionate about the project that it allowed me to reach out to people and say, “Hey, set up meetings. Tell them, “Well, listen to a guy who wants to make some films, there’ll be some snacks. Maybe that’s interesting to them, maybe that’s not. There’s no hard sale with nothing. I’m just gonna passionately tell you what my story is about and how I plan to do it and then get to read the business plan and you’ll make a decision. And so it took a little while but eventually we raise enough to go into pre-production and start casting and start filming. Ashley: Okay. And so let’s talk about the crowd funding for a little bit. Did you know much about that going into that? And then how did you actually raise the $30,000 because that’s not insignificant $30,000 on Kickstarter. Stephen: Yeah, I knew a little bit about it. I knew Kickstarter, I knew Indiegogo and I was prepared to use probably Indiegogo because the flexible one appealed to me a little bit more even though there’s a lot of benefits to doing the all or nothing because people take you more seriously, but I wasn’t brave enough to go that route at first. I listened to a podcast on a site called www.filmspecific.com run by a former sales agent named Stacey Parks when she interviewed somebody who did a successful crowd funding and I learnt that she utilized a campaign manager. So I reached out to this campaign manager and we met and we talked and she said, “I just signed up with a brand new crowd funding company and so you won’t have to pay an upfront fee because I’m on retainer. So it’s all back in commission.” That kind of thing. I was like, “Okay, great. Sounds good.” So we went out with that company and we went around utilizing her strategies of starting a few weeks before. It’s essentially a full time job. You got to reach out to everybody you know who’s active on twitter and Facebook and Instagram and everything you can be active on. You just keep at it, keep at it, keep at it and I think the combination of that, and I think people sparked to the underdog aspect of the story because it kind of pararelled an underdog aspect of someone trying to raise money for a film and I think that helped. And yeah, eventually we [inaudible 00:34:01]. Ashley: Okay. So now you’ve got the Kickstarter money, you’re going out trying to get some private investors. What was your strategy there? Was it again same sort of thing, just looking through your roller decks and emailing, “Hey, is there anybody you know who might be interested in meeting?” Maybe walk through that process of actually getting those meetings that you mentioned. There’s some snacks and you passionately pitching. Stephen: Yeah, it was kind of like what you said. I asked everyone I knew who’s to reach out to people they knew and say, “Would you like to meet with a guy who’s trying to make a film? There’s no hard sell, there’s gonna be snacks there but you may learn something from it.” And you know, you meet different types. Some are just very curious, some have interests of their own of making films, some have relatives or children that they wanna be filmmakers and so maybe they can learn something. So you just start going out there and again the key to it is just be honest and passionate. You have to be very honest about the risk. If you’re investing because you wanna make money, there’s a million better investments than investing in film, and the returns on the investment even if it does make money is not gonna be immediate. It can be one to three years if it recoups at all. So I would always stress just how much this is not the kind of investment you wanna make if you wanna make money. It’s more about, do you believe in this actual project, do you believe in this movie, or would you be excited about it? If it didn’t succeed would you be excited about that you helped fund it and helped it happen? Maybe if you give enough you’ll get a producer credit or some kind of credit. Maybe you get a set visit, all these kinds of things. You’re trying to sell ego, that kind of…”You get to part of a…” “Oh, a film. Well, I get to be on set. I’ll be part of that.” So you try to sell that aspect of it. Not in a hard way because people don’t like the hard sell, but you just try to get them excited about their own kind of self-interest and hey, that sounds exciting for me. That’s kind of how it worked out. Ashley: You mentioned your business plan. Did you try and at least formulate some sort of a plan towards recoupment? Did you do a little research on the genre, you know, a dance…feel good dance movie. Is there some precedent for those films making money, did you talk to any distributors about is this a film that they thought they could sell? What was actually in that business plan? Stephen: Yeah, absolutely. I was really pleased with my business plan because I think it put together really kind of a way that we could actually see it recouping. A big part of the plan was to pre-bill the audience. There’s about at least 9,000 dance studios in this country alone, and add Canada and the world. And I was [inaudible 00:34:41] a list of all of them and wanted to create ways to get them involved far before we ever started filming. Get them excited about the film, get them to know about it. Try to create a large family so that they could follow along and feel personally invested. And then I would create contests. I had a contest…the dance studio that voted the most for them to be in a scene in the film. And so that got some interest from around the country. And we ended up putting one of the dance studio that voted the most, we ended up putting them in a little scene if the film. All those kinds of things you try to do and then I talked about the www.filmspecific.com website and Stacey has a lot of things on there that shows you like what foreign sales could be in each territory, the low end, the high end. So I put that whole charge in there and said here’s a possibility, then I used case studies from other films that would either try limited theatrical runs and how they did it and what succeeded for them and what didn’t and how we could do even better because we have really a much more marketable idea. Some of those ideas were very, very niche. So yeah, I put as much of that in as possible but I kept reiterating the risk. So it was all…you know, you wanna do both. Ashley: Again, just to get a sense of the scope, how many of these investment meetings did you have and what percentage of them actually resulted in some form of investment? Stephen: I had probably I think maybe seven, eight. Somewhere around there. Then after that it’s more…you get to talk to more people on the phone, you know, because they’re people from not in the state. That kind of thing. It kind of spreads out. Yeah, it was a little hit or miss. I think I had more success once the film actually started. We had some early people say, “Yeah, yeah, I’ll invest. I’ll talk to some people,” and it kind of snowballs a little bit. It wasn’t a fast process. It took I think a year before we finally built it up to the point where we felt we had enough money to start filming. Ashley: Okay. And you mentioned to the dance studios contacting them and getting them on board. Was that a part of the Kickstarter campaign, because that seems like a great way to get people that are into tap dancing sort of involved in the project early on. Did you reach out to them during this Kickstarter, was that part of that or was it after the Kickstarter? Stephen: It was mostly after…yeah, because the dance studios…I did reach out but didn’t receive much success in that because at that point it’s still…there was not so much in it for them. My aim after the dance studio is I wanna help us as a film and I wanna help you as a dance studio. I want to do a partnership, maybe one day when we get out into theaters in your city, maybe we could put on a live dancing show afterwards. Maybe I’ll get local press, maybe we’ll be out to bring your tap dance studio on TV on some kind of local press liaison and get your business some exposure. I always wanted to include that there’s something in it for us, obviously we want people to see the film, but it’s gonna help them out as well and give them a memorable experience if they get to watch a film and then see their students and themselves dance afterwards. During the crowd funding I was so overwhelmed with just making that work, I didn’t have the time to reach out to do that as much. Ashley: Was there any worries as you were getting these dance studios involved, like if it’s a dance studio in Wisconsin that ends up winning this thing, then you got to fly your whole crew there to shoot this scenes which could add a lot of additional costs. Was there any worry of that? Stephen: No, I made it clear when I reached out to them that if they won that we’d hire a local crew, because for this scene, it was gonna be seen on a laptop. It didn’t need to be…you know, the full deal. It just needed to be like a class. If they film their own class footage that’s all we needed, we were just gonna use 10 seconds of it. So yeah, local. Anyone in the country could win. Ashley: Very smart, very smart. So can you tell us where people can see Dance Baby Dance? Do you know what the release schedule is gonna be like and when it’s gonna come out? Stephen: Yeah, we’re getting a weeklong LA release. Premier is January 19th. It will run from January 19th through the 25th at Arena Cinelounge on Sunset in Hollywood. After that we’re gonna try do some cities. But I believe on January 19th we’re also coming out on Amazon for VOD. Then two months later we’ll probably do more platforms and eventually we’ll be on all the VOD platforms. But we’re starting with Amazon and I believe, I don’t know 100% but I believe it’s gonna be available starting January 19th. Ashley: Okay, perfect. I just like to finish up the interviews by asking the guest to kind of just tell us how people can keep up with what you’re doing, twitter, Facebook, blog, anything you’re comfortable sharing, I will round it, put it in the show notes so people can click over it, but anything you have like that just mention it now so people can kind of follow you and get to know you a little better. Stephen: Yeah, we’re all over social media in our website. On our website you can go to www.dancebabydancemovie.com and you’ll see. You can click on our Facebook page, our Instagram page, our twitter page, our YouTube page. We also have a place where you can sign up for our mailing list and that’s our newsletter. We’ll be getting information out to people. We have a pledge to see the movie button there. For Facebook and everything else it’s Dance Baby Dance Movie. Some of that is DBD movie. So the best thing to do is go to the website and just click on the little icons with social media site. I also have my own personal ones that essentially follows my journey as well and that’s Stephen_Kogon. That’s the Instagram one and then on Facebook I just have a regular page and then I have a twitter page for both. They can follow us through any of those ways. Ashley: Perfect. Well Stephen I really wish you luck. I appreciate your coming on and talking with me today and I really with you luck with this film. Stephen: I appreciate. It was great talking to you. Ashley: So just a quick update on Dance Baby Dance. I noticed this morning that the film was available in Amazon Prime, so if you have the Amazon Prime you can actually watch this film at no additional cost, but it should be out there on all the digital platforms, iTunes and everything else. So if you have a minute definitely check that out and take a look at it. A quick plug for the SYS screen writing analysis service. It’s a really economical way to get high quality professional evaluation on your screenplay. When you buy our three pack you get evaluations at just $67 per script for feature films and just $55 for teleplays. All the readers have professional experience reading for studios, production companies, contests and agencies. You can read a short bio on each reader on our website and you can pick the reader who you think is the best fit for your script. Turnaround time is usually just a few days, but rarely more than a week. The readers will evaluate your script on six key factors—concept, characters, structure, marketability, tone and overall craft, which includes formatting, spelling and grammar. Every script will get a grade of pass, consider or recommend, which should help you roughly understand where your script might rank if you were to submit it to a production company or agency. We can provide an analysis on a feature film or a television script. We also do proofreading without any analysis. We will also look at a treatment or outline and give you the same analysis on it. So if you’re looking to vet some of your project ideas, this is a great way to do it. We will also write a log line and synopsis for you. You can add this log line and synopsis service to an analysis, or you can simply purchase this service as standalone product. As a bonus, if your screenplay gets a recommend or a consider from one of our readers, you get to list the screenplay in the new SYS Select data base, which is a data base for producers to find screenplays and a big part of our SYS Select program. This is a new service but we’ve already got producers in the system looking for screenplays so it’s a great way just to get some exposure for your script. As a further bonus, if your screenplay gets a recommend or consider from one of our readers, your screenplay will get included in our monthly best of newsletter. Each month we sound out a newsletter that highlights the best screenplays that have come through our script analysis service. This is a monthly newsletter that goes out to over 400 producers who are actively looking for material. So this is another great way to get your material out there. But wait, there’s more. As a further bonus, if you script gets a recommend from our reader, you get a free email in Facts Plus to the list of industry contacts. This is the exact same blast service I use myself to promote my own scripts and it’s the same service I sell on the website. It’s a great way to get your script into the hands of producers who are looking for material. So if you get a recommend you get both bonuses and if you get a consider you get the first two bonuses. So if you want a professional evaluation of your screenplay at a very reasonable price, check out www.sellingyourscreenplay.com/consultants. On the next episode of the podcast I’m gonna be interviewing writer, director Reece Evanshen. He just did a really cool low budget sci-fi film called Defective. We talk through how he came about to get that film produced and we also talk through the start of his career, kind of how he got his start and worked his way up to writing and directing this feature film. Keep an eye out for that episode next week. To wrap things up I just wanna touch on a few things from today’s interview with Stephen. I thought that there was some good tactile tips in this interview. Doing extra work is a very common thing to do when you first arrive in LA. I actually did it myself. It’s a quick, easy way to get onto a film set and see the film making process from the inside. You can make a little bit of money and it’s fairly easy to actually just get cast as an extra in pretty big budget films. When I first got to LA as I mentioned, I think I was on Space Jam, that was the Michael Jordan movie from the mid-90s. That was a budget film like that that you just make a few bucks but it’s just interesting just to be on set especially for myself. I had never been on a movie set before. That was really my first exposure to production. I did a lot of smaller films too. There were some TV shows and stuff that I got on too. And again as I first arrived to LA I didn’t have a job, I was still looking for a job. It was a good way just to make a little money, be on set, meet other actors, other writers. There were some people I met, I’m still friends with one of the guys I met actually as an extra. So it’s a good way. There’s a lot of new people to LA doing this sort of work. I highly recommend it if you roll into LA, don’t have a job lined up. That’s a great way just to get out there and make a little money and just start to learn about the business a little bit. The main take away here though from this interview is just how passionate Stephen was about this project. He didn’t really know how to produce a feature film, he didn’t know how to tap dance but he just loved his story and was passionate about it and he went out and made it happen. I think that’s awesome. I get a lot of emails especially after talking about The Pinch on the podcast so much. I get a lot of emails asking very small minute questions…you know, what camera did you use, how much did this cost and these kinds of very sort of the miniature of producing. I always feel like a lot of people that are asking those very small sorts of questions, you’re gonna figure that stuff out. Those are sort of minor details and you will figure that out through the process. That’s part of the learning curve. It’s just going out there and doing it. I’m happy to share what I did and how I did things but at the end of the day it’s about just going out there and doing it. That’s how you really get to learn about this, you know, talking to me, listening to this podcast. I certainly think those are beneficial and they can help you, but the end of the day if you wanna be a screenwriter you got to write scripts. If you wanna be a filmmaker, you got to get out there and make films. Just talking about it, reading about it, listening to podcasts about it isn’t enough. Again the main take away here was just how passionate Stephen was for his project and just went out there, didn’t know exactly what he was doing, didn’t exactly know how he was gonna get it all done but just muscled through the process and I’m sure learned a lot and now he’s got a feature film that he wrote, directed and produced.